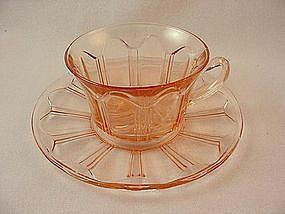 This depression glass cup & saucer set is the Newport or Hairpin pattern. Made by Hazel Atlas during the 1930's, the color is amethyst, though Hazel Atlas called it 'Burgundy' in the original ads. Excellent condition, I have 8 available. 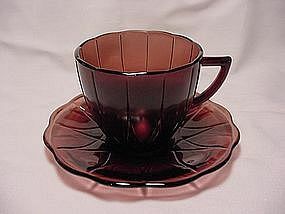 Price is per cup & saucer set. See my other listings for more in this pattern. 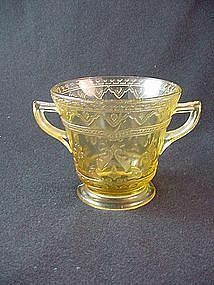 This depression glass cream soup bowl is the Newport or Hairpin pattern. 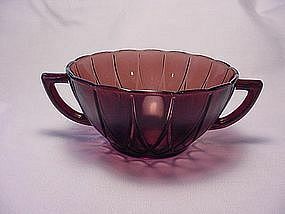 Made by Hazel Atlas during the 1930's, the bowl is amethyst glass. (Hazel Atlas called this 'burgundy' in their ads, but it's a true amethyst.) Excellent condition. I have 6 available, price is per bowl. See my other listings for more in this pattern. Offered here is a really lovely glass salad set. Both the fork and spoon are 9 1/2 inches long. The handles are light cobalt blue, while the bowl and tines are crystal. Perfect condition, price is for the set. 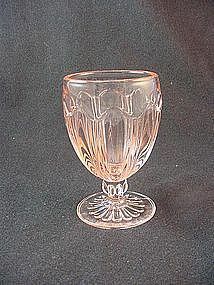 See my other listings for more glass serving pieces - including a pink salad set to match. The Mt Pleasant pattern was made by L.E. Smith glass company in the 1930's. 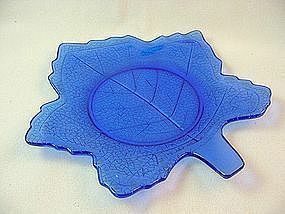 This 8 inch leaf shaped plate is in excellent condition. I have 3 available, price is per plate. See my other listings for more in this pattern. Colonial, or 'Knife & fork' as it's come to be known is a Hocking pattern that was made from 1934 to 1938. 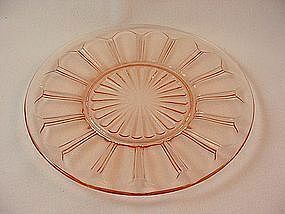 Offered here is the 8 1/2 inch luncheon plate in pink. Excellent condition, I have 4 available. Price is per plate. See my other listings for more in this pattern. Colonial, or 'Knife & fork' as it's come to be known is a Hocking pattern that was made from 1934 to 1938. 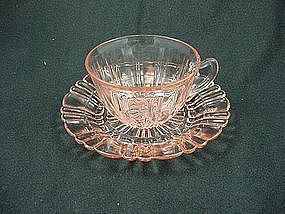 Offered here is the cup & saucer set in pink. Excellent condition, I have 2 available. Price is per set. See my other listings for more in this pattern. 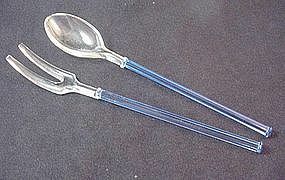 Colonial, or 'Knife & fork' as it's come to be known is a Hocking pattern that was made from 1934 to 1938. 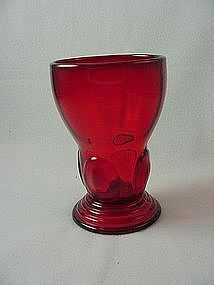 Offered here is the 4 inch 5 oz footed tumbler in pink. Excellent condition, I have 2 available. Price is per tumbler. See my other listings for more in this pattern. 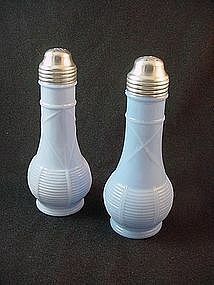 These kitchenware shakers were produced by Jeannette Glass Company during the 1920's - 30's. 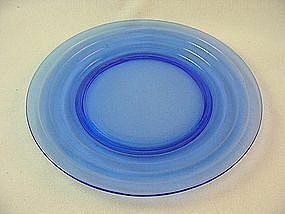 The color is called Delphite blue, an opaque blue glass Jeannette used for their kitchenware line. About 6 inches tall and excellent condition, price is for the pair. 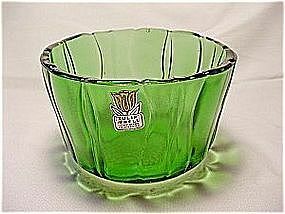 This fine rib mixing bowl was made by federal Glass Company in the 1920's. 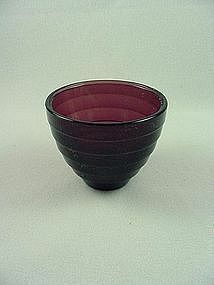 6 3/4 inches in diameter, the base is square so that the bowl rests flat when in use. This bowl was sold as part of a nesting set of mixing bowls - here's your chance to complete your set. 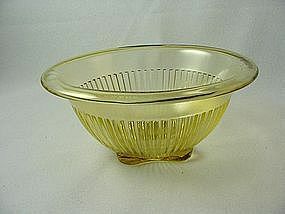 Of course, I have enough of these that you can use them for individual chef salad bowls or hearty soup bowls. I have 9 available, price is per bowl. See my other listings for other sizes. Although this pattern was officially named 'Sylvan' by Federal Glass Company, it has always been referred to by the collector's name, Parrot. It was produced for only one year, 1931-2, and is scarce today. Offered here is the 5 inch berry bowl in amber. Excellent condition, I have 6 available. Price is per bowl. See my other listings for more in this hard to find pattern. 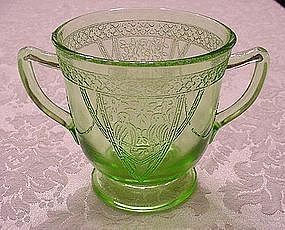 Madrid is a depression glass pattern that was made by Federal Glass Company from 1932 to 1938. Pictured is the amber sugar in perfect condition. I have 2 available, price is per sugar bowl. I also have other pieces in this pattern available - check my other listings or ask! 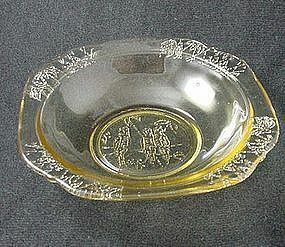 Georgian was produced by Federal Glass Company from 1931 to 1936. This pattern is usually called 'Lovebirds' because of the 2 little parakeets perched in the decorative 'cage'. 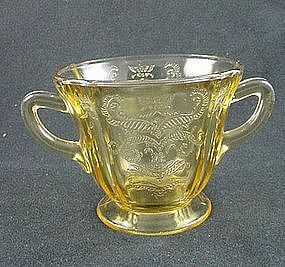 Offered here is the 4 inch sugar bowl in perfect condition. (This is the larger of the 2 sizes made) See my other listings for more in this pattern.